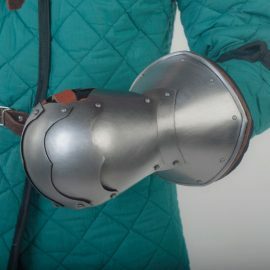 Basic and practical protection of the elbows. Light weight. The plain shape provides perfect movability. Steel elbows have leather straps and laces to be fixed properly at the place they should be. This is ideal supplementary to your armor. Price for the pair. Please notice, that measurements should be with padding/gambeson. Basic and practical protection of the biceps. Light weight. The plain shape provides perfect movability. Steel biceps have leather straps and laces to be fixed properly at the place they should be. This is ideal supplementary to your armor. Price for the pair. Please notice, that measurements should be with padding/gambeson. This steel gloves with movability of each finger allow you to handle any weapon more conveniently, but without losing their protection functions. The inner layer of gloves is covered with protecting paint, partly fastened with natural leather. With leather gloves sewn inside. 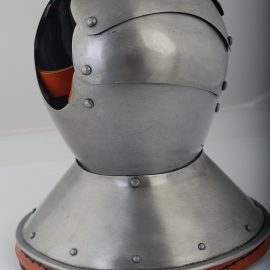 Basic and practical protection of the shoulders. Light weight. The plain shape provides perfect movability. Spaulders cups have leather straps and laces to be fixed properly at the place they should be. This is ideal supplementary to your armor. Please notice, that measurements should be with padding/gambeson.